Folks, I’ve got plans for 2014. Plans for switching the direction of my projects on this blog. 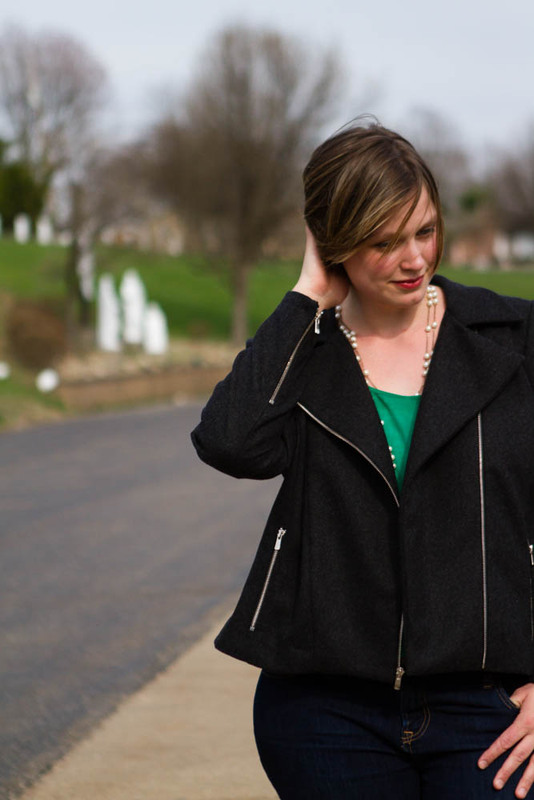 I want to get back to the heart of why I decided to learn to sew in the first place. (Bonus points if you have been reading long enough to know what that reason is!) To prepare for this shift, I am clearing out my old unfinished projects. This is a prime example. 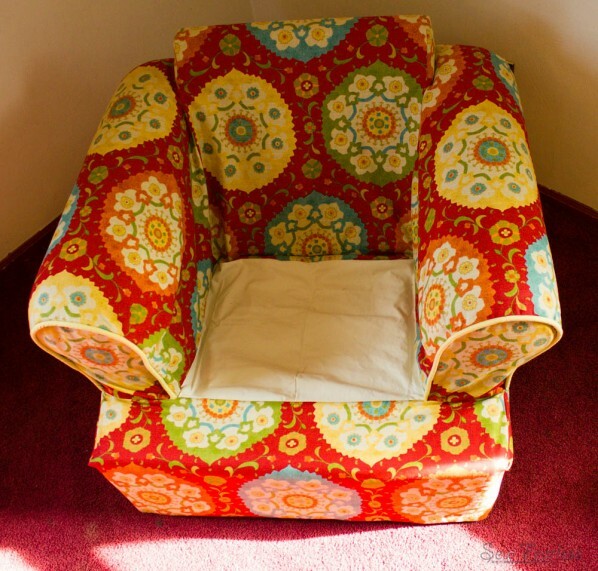 I bought fabric two years ago to recover my favorite chair – The Nursing Chair. I finally finished it this week. I spend hours and hours sitting in this chair every day (and, as of late, long parts of the night as well). 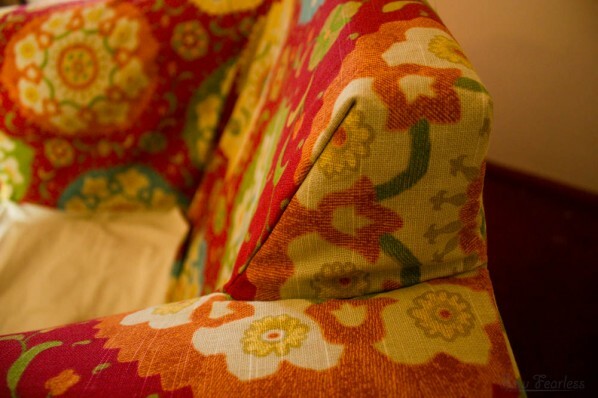 It is the chair equivalent of your favorite broken in pair of tennis shoes – ugly, worn, but oh so ridiculously comfortable. I will cry if/when this chair ever breaks. 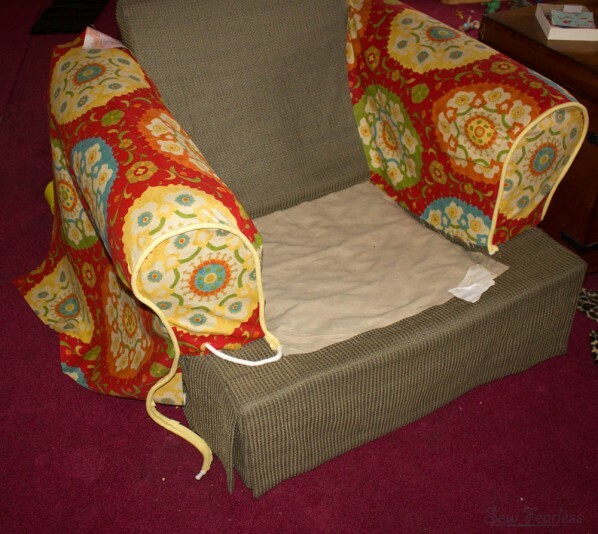 Originally, I had planned to legit re-upholster my Chair o’ Comfort, but after a recent stomach bug passed through the house, I decided this time in my life calls for slipcovers. I can’t really give a straight up tutorial on how to do this, because every chair is different. However, I will share a general overview of how I tackled it. I hope this can help you if you want to attempt it. I purchased 9 yards of home decorating fabric (58″ wide) from Jo-Ann Fabrics. I used all but maybe a half yard of it. I covered the back and seat cushions first. 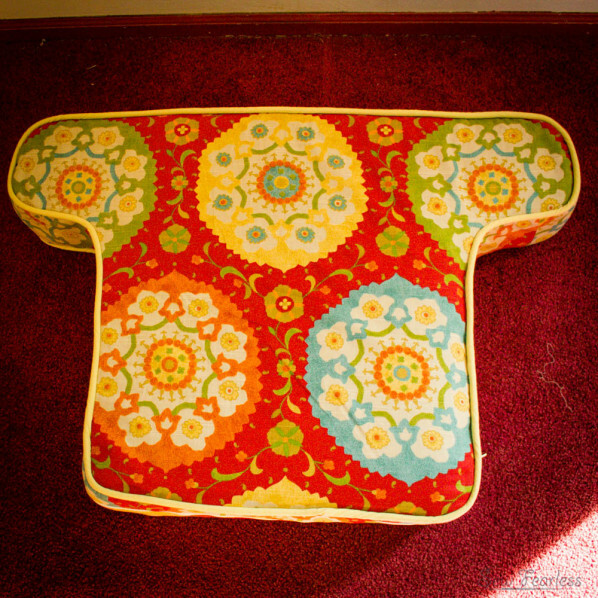 The shape of the seat cushion was easy enough to trace off for a pattern, but the back cushion needed a different strategy. 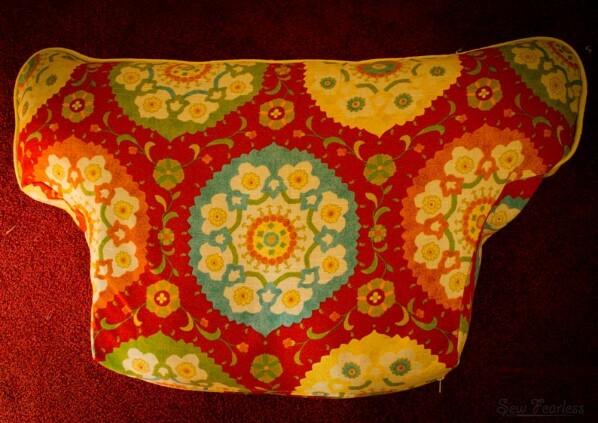 To make the pattern, I laid a piece of craft paper over the cushion. 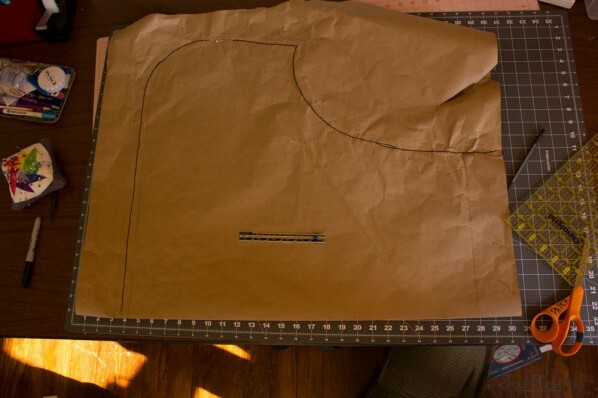 I traced along the pins to draw out the pattern, added seam allowances to finish the pattern. Here it is folded in half along the center and the seam line smoothed out. 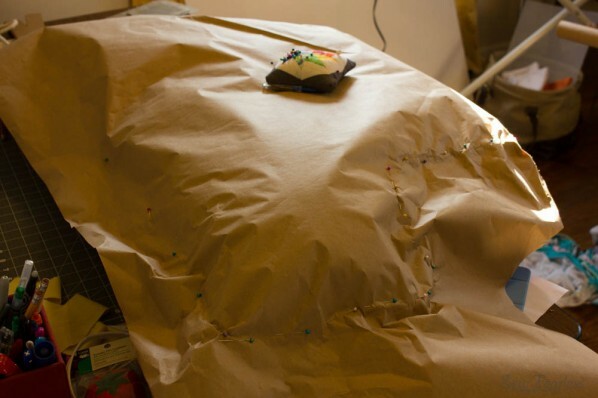 Then, I repeated this pinning-tracing technique for every fabric section of the original cushion. 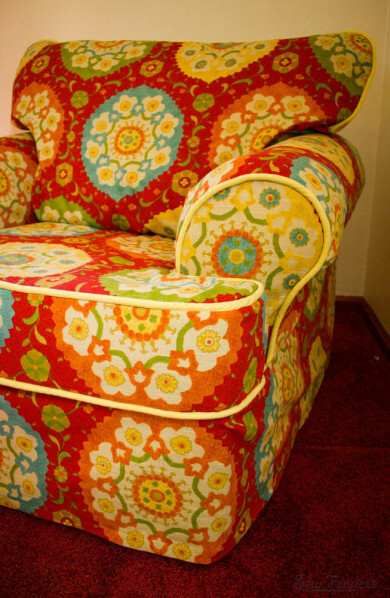 I inserted piping on the slipcover wherever it was used on the original cushion. This piping is made with a 5/32″ cord. (See this tutorial for how to make your own piping.) 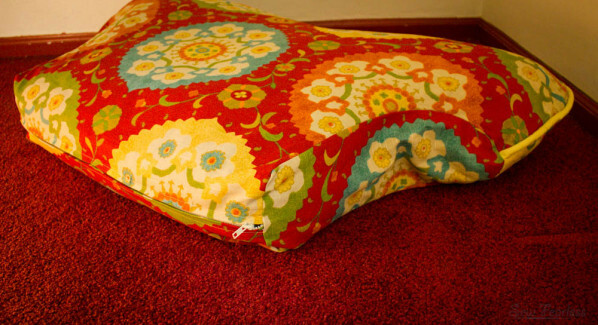 Besides giving a project more visual oopmph, piping gives more structure to the shape of the cushions and hides stitching at the seams. Next, I tackled the body of the chair, starting with the chair arms. Once again, I pinned and traced to make the pattern pieces. After the chair arms/sides where sewn, I abandoned the careful pattern piece drafting and started pin fitting draped fabric to the chair. 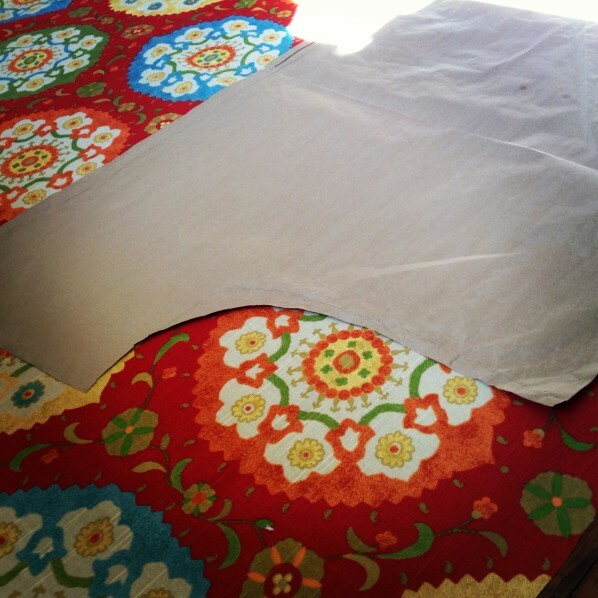 With the fabric inside out, I pinned the fabric to fit, traced the seam lines and then sewed. I found it helpful to work in sections at a time. Rechecking the fit after every seam was sewn. 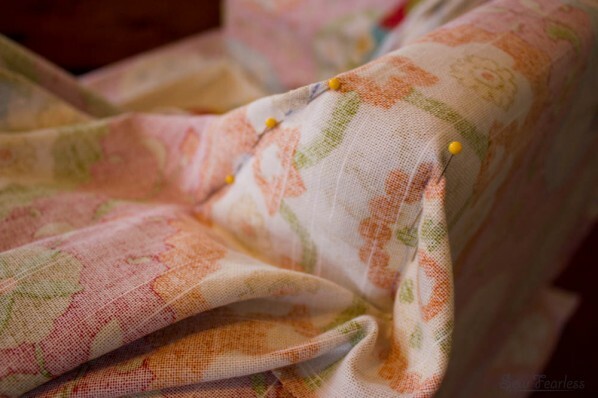 Lastly, I pinned up the hem of the chair, pressed, and slip-stitched it in place. And that’s that. My favorite chair is all glammed up and ready for its usual duties. My vacuum is broken! I swear! Jodi it looks amazing, I love the fabric. 1/2 a yard you say…………can we say tote bag! 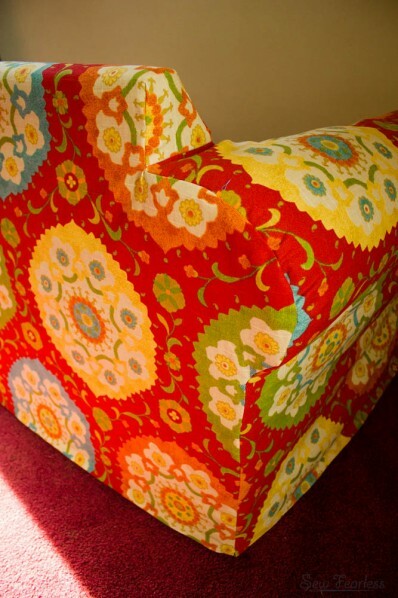 Ok – that is gorgeous-love the fabric choice! I am inspired. Wow wow wow!! This is so awesome Jodi. Kinda gives me hope that maybe I could actually do this. 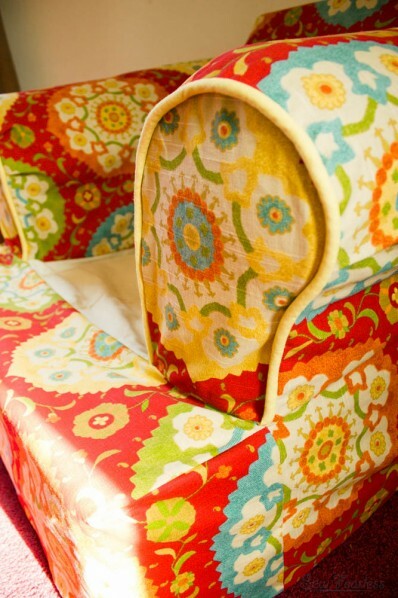 Also, the before fabric looks just like my nursing chair! So very nice. Love the bright colors. 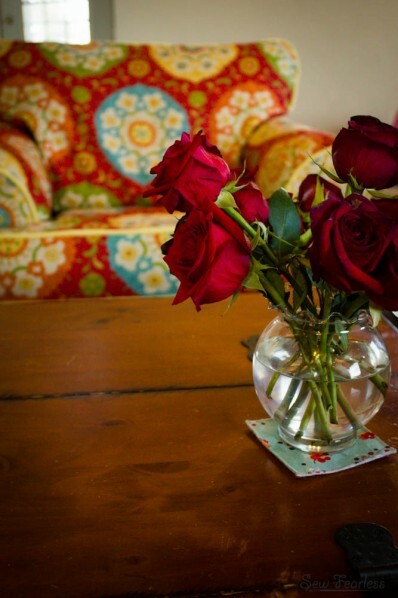 Jodi …..you are incredible……the chair us beautiful!! what a fabulous job. The color of the chair is breath taking. I would love to do that. LOVE LOVE LOVE!!! It looks incredible! I’ve slipcovered chairs (not very well) but never thought to pin the paper to the chair for drawing a pattern! Fabulous. The chair looks incredible and I love that its all washable. 😀 You are brilliant. It looks gorgeous! 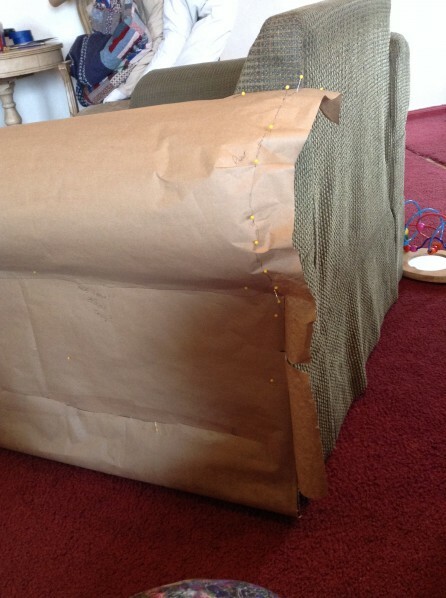 Slip covering the couch is in my 2014 plan. 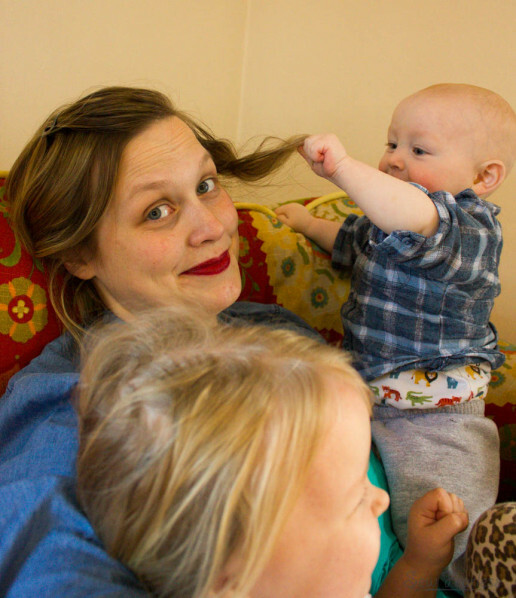 Our sofa is like a beloved member of the family. 😉 Thanks for sharing your process! The chair is gorgeous! 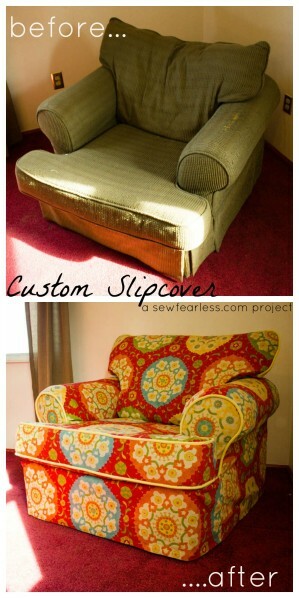 I love that a simple (but not really so simple) slipcover can revive furniture. WOWEE!!!! Great chair… I don’t know how you find the time to…. sleep? You really did a remarkable job Jodi! Beautifully done! 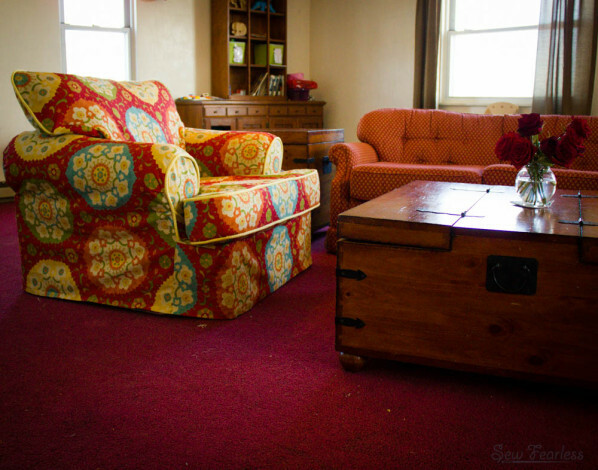 I actually do have a chair that I want to either recover or slipcover… but I keep putting it off in favor of other projects. Wow! This is just spectacular! 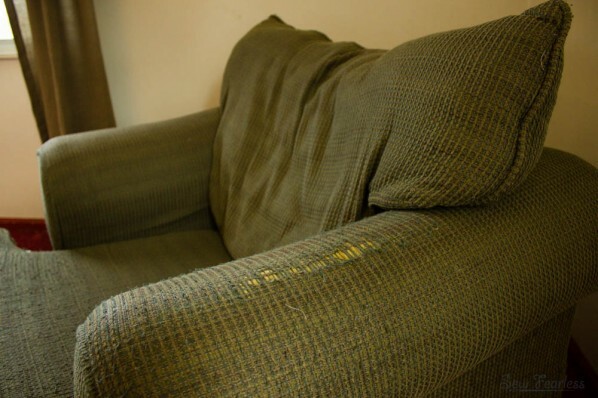 I took a reupholstery class years ago; did one chair and said never again. I know that this is different, but your result is just wonderful! OMG You did a great job on that chair. I would love to do that too. Don’t know if I have it in me to do such a great job. I really need to do something. My living room has been the same for far too long. HAHA. so glad i found your site! great great job on the chair cover. I made pillows for my sofa with that same fabric. 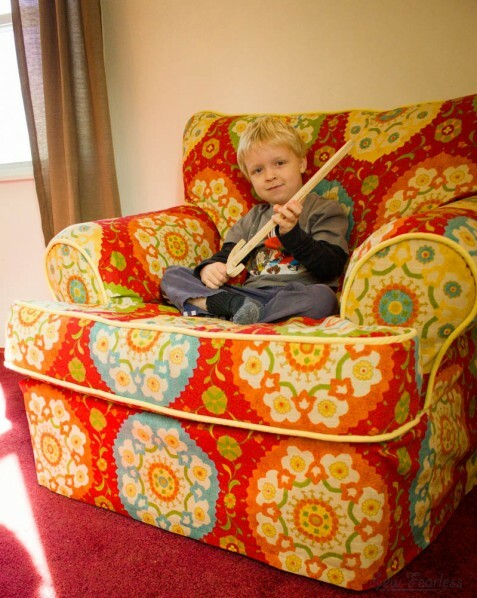 & I’ve been wanting to re-upholster my tot’s chair which is similar to yours but tot size, but i’ve been a little intimidated by it…don’t know why because I have been sewing for many years. But I think it’s really because i am lazy & have a lot of unfinished projects lately. But this will most definitely be on my new year’s resolution list. Thanks for the inspiration! It looks totally professional, awesome job! This is spectacular! I’d love to tackle a job like this for our sofa… I’ll have to go home and have a look at the cushions tonight. Beautiful makeover! Any idea what the name or maker of the fabric is? I love it and can’t find anything that is quite as colorful and classy as it is!